As many Vancouverites know, April is the month when the City celebrates the Cherry Blossom Festival. Ornamental cherry trees, like other spring-flowering trees, are often seen as positive symbols of beauty and rebirth. These attributes are especially important in providing a public resource that citizens can admire and celebrate in our parks and gardens and on the streets—especially in light of a general dearth of symbols that have the ability to unite people from disparate backgrounds. Personally, I believe flowering cherries are proxies for these deep cultural longings. 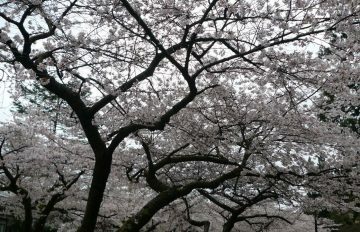 Established little more than a decade ago, the Cherry Blossom Festival, which was borne out of this desire to bring communities together around a celebration of beauty, has been successful beyond imagining. Vancouver loves its cherry trees. 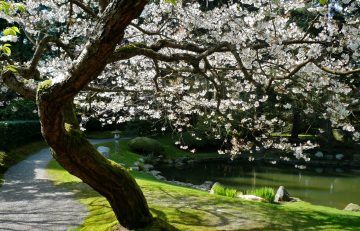 Nitobe Memorial Garden is certainly famous for its ornamental cherries. These trees are primarily the classical Sato-zakura (Japanese village cherries). The enormous Tokyo cherry, Prunus yedoensis ‘Somei-yoshino’, in the centre of the garden probably dates from the early 1960s. This is the same cultivar that is the cherry of Hanami (cherry viewing festivals) in Japan. The Nitobe specimen, along with other ‘Somei-yoshino’ outside the garden nearby on Lower Mall are usually in full bloom in the first or second week of April. 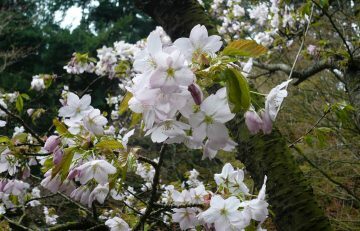 Other April-flowering cherries at Nitobe include ‘Kanzan’, ‘Ojochin’ and the fragrant and rare ‘Taki-nioi’. 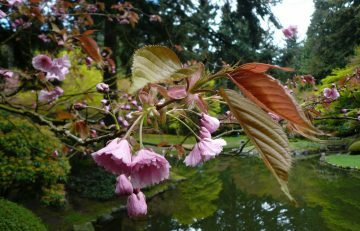 For many years, UBC Botanical Garden has been involved in propagating Vancouver’s ornamental cherry trees, especially the rarer ones. This project is ongoing at the Botanical Garden Nursery, but a number of trees have made their way into the Peter Wharton Cherry Grove, which is located at the Garden’s entrance west of the parking lot. The cherry trees include Sato-zakura, as well as modern European and American selections of Japanese Prunus species. All April-flowering cultivars, these include ‘Gyoiko’, ‘Ojochin’, ‘Shirotae’, ‘Surugadai-nioi’, ‘Ukon’, and ‘Umineko’. Unlike most contemporary flowering cherry plantings, none of the trees in the Wharton Cherry Grove are grafted. Instead, they are all growing on their own roots. The trees have been left for the most part unpruned, so that they might adopt a more natural branching structure. Originally propagated in our nursery by Kevin Kubeck, the trees in the Grove were all planted out by students in the Horticulture Training Program in March of 2015. 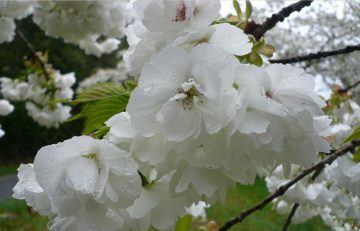 As the cultivars planted in our Peter Wharton Cherry Grove come into bloom, you can find photos of them on our forums. The list of cherries in the grove is not extensive, but all of the trees have a story to tell. Below are descriptions of all of the cherries mentioned above. A classic sato-zakura known from before 1780 in Japan. ‘Gyoiko’ has purple-red-streaked green-and-white flowers, the outer petals mostly green and the inner petals variously green-striped. A rare and unusual cultivar, the depth of colour in its flowers is accentuated by mild winter temperatures. The name refers to the richly coloured, white, green and purple robes of female courtiers in ancient imperial Japan. The most commonly planted of all flowering cherries, also sometimes known as ‘Kwanzan’ or ‘Sekiyama’. A fast growing tree with a large, upright, spreading crown and with opulent, long-lasting double pink flowers produced in late April or May. The leaves emerge bronze green at the same time as the flower buds open. A Sato-zakura (village cherry) in cultivation in Japan since the 17th century. The usual height and spread is 9 m × 9 m (30ft). Given the name “large lantern cherry” for its unusually large, inflated, hanging flower buds, this Sato-zakura is an old cultivar, known since the late 17th century. ‘Ojochin’ tends to produce broad leaves, some pointed and some blunt-tipped, and it has stiff branches, but it has a strong constitution and is beautiful when in bud and flower. This very broad-spreading Sato-zakura usually blooms in mid April when the leaves are nearly fully developed. These are bright, fresh green and have hair-like tips on the marginal teeth. Attractive and distinctive as they are, it is the flowers that makes ‘Shirotae’ famous. Borne profusely from the horizontal branches on slender, long stalks, the large, pure white, double flowers are deliciously fragrant. Shirotae has been a popular tree since about 1850 in Japan. The name refers to a kind of white cloth. An uncommon tree in Vancouver, except in a few parks and on selected streets, such as the Cambie Heritage Boulevard, and at UBC, where it is relatively common. The seed parent of ‘Akebono’ to which it closely resembles, but its late March or early April flowers are slightly smaller and paler upon emergence. Older specimens of Tokyo cherry are distinctively umbrella shaped, with few sturdy branches. 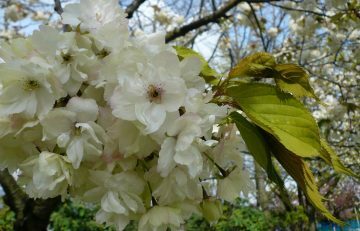 A richly fragrant, white flowered selection of the Oshima cherry (Prunus serrulata var. speciosa). The name alludes to a particular hill in Tokyo known as “Surugadai.” The epithet “-nioi” means fragrance. This cultivar is notable not only for its lovely crushed-almond scent and for its tongue-twisting name, but for its characteristic ragged-edged petals and broad, spreading, dome-shaped crown. An exceptionally rare Sato-zakura that typically forms an irregular, spreading crown with drooping outer branches. Locally, this cultivar is known only from Nitobe Memorial Garden at UBC. The flowers have five ragged-edged petals and are pure white, contrasting well with the emerging purple-bronze foliage in mid- to late-April. The almond scent of the flowers is sublime. This moderately upright-growing Sato-zakura produces large flowers of an unusual yellowish colour. In Japanese, the name ukon means turmeric, a spice that stains yellow whatever it touches. ‘Ukon’ has a robust constitution, large, double flowers and dull coppery leaves in late April. The leaves change to deep green before turning orange and red in autumn. Like ‘Gyoiko’ the depth of colour in its flowers is determined by winter temperatures. ‘Ukon’ has been a popular cherry since before 1800 in Japan. A little-appreciated cultivar, ‘Umineko’ is a modern hybrid of two Japanese species—the shrubby Fuji cherry (Prunus incisa) and the Japanese hill cherry (P. serrulata subsp. spontanea)—made by the renowned English cherry breeder, Collingwood (Cherry) Ingram and named by him in 1928. 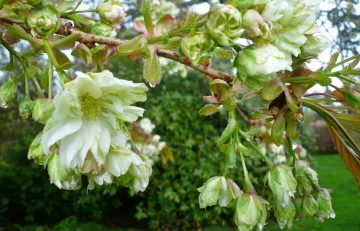 ‘Umineko’ produces masses of beautiful, five-petaled, pure white flowers against a background of fresh green emerging leaves, usually in mid April. The name means seagull. This cultivar of the Japanese higan cherry (Prunus subhirtella) blooms reliably in February or March with masses of purple-pink flowers. Whitcomb cherry forms a flat-topped, eventually umbrella-shaped crown with numerous twiggy branches. It was selected for its vivid flowers and excellent constitution and is named for Seattle resident David Whitcomb (1879-1966) in whose garden the tree arose. Yes, Prunus ‘Shirotae’ is often called the Mt. 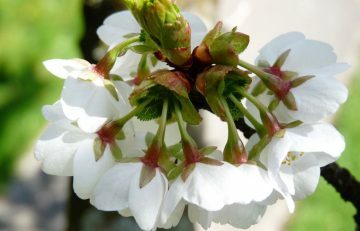 Fuji cherry (especially in the United States); however, there is the potential for some confusion with this name, as another species, Prunus incisa, is known as the Fuji cherry. Is shitotae also called Mt. Fuji? Is Taki-nioi small saplings suitable for bonzaing available for purchase in your store? Please let me know. Love the photos and the origins of the names- thank you!